Vancouver Island Travel & Tourism: Mayday, Mayday…this is ORCA SPIRIT! Mayday, Mayday…this is ORCA SPIRIT! Well it certainly wasn't a distress call, but an invitation from Orca Spirit Adventures to check out their whale watching business. Oriana Smy, Sales Manager, organized a wonderful day for us. Paul, our driver for the event, shuttled us over to the Canoe Brewpub where we enjoyed food and drinks. The CANOE BREWPUB, Restaurant and Marina located at 450 Swift Street features waterfront patios and the best western exposure along Victoria's Inner Harbour. They offer some of the best handcrafted beers in Victoria, a diverse award-winning wine list, a pub, lounge, dining room, patios and friendly, knowledgeable staff. 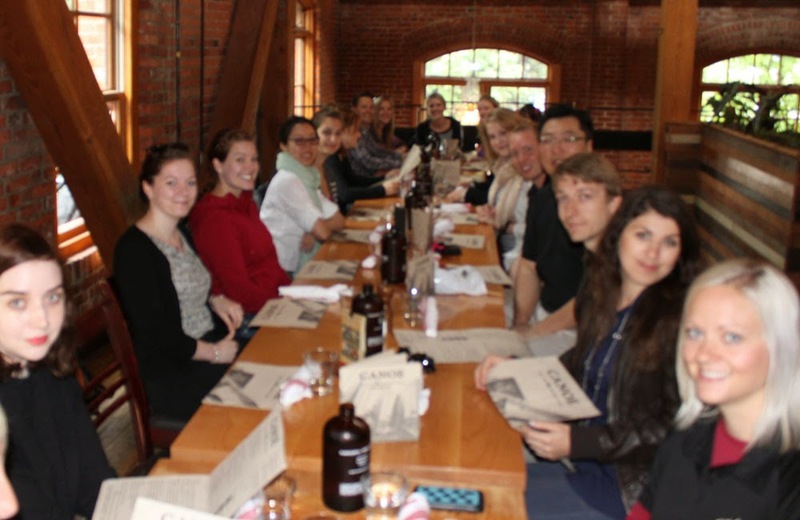 The soaring timber frame and rustic brick architecture creates a vibrant atmosphere, the perfect setting for our group of twenty where we sat upstairs. The Canoe Brewpub provides comfort food, showcasing local farmers and products. The menu is always changing and highlights seasonal organics, local quality meat and Oceanwise sustainable seafood. Our meals were delicious and the staff served our large group with ease. Thanks to Amanda our host and Pam our server for a great lunch and brunch. Part one of our Mayday Adventure was over and Paul shuttled us back to the docks behind the Coast Harbourside Hotel. Whale watching was offered as Part Two of our adventure. The “wild at heart” half of our group chose to go out in a zodiac, with Captain Tristan and Naturalist Alex. Obviously they needed their souls stirred! The zodiac ride was reported as being exhilarating and a tiche wet. The zodiacs are fast and fun and certainly an adventure to remember. There is a fully enclosed washroom on the zodiac… so no worries on that account. 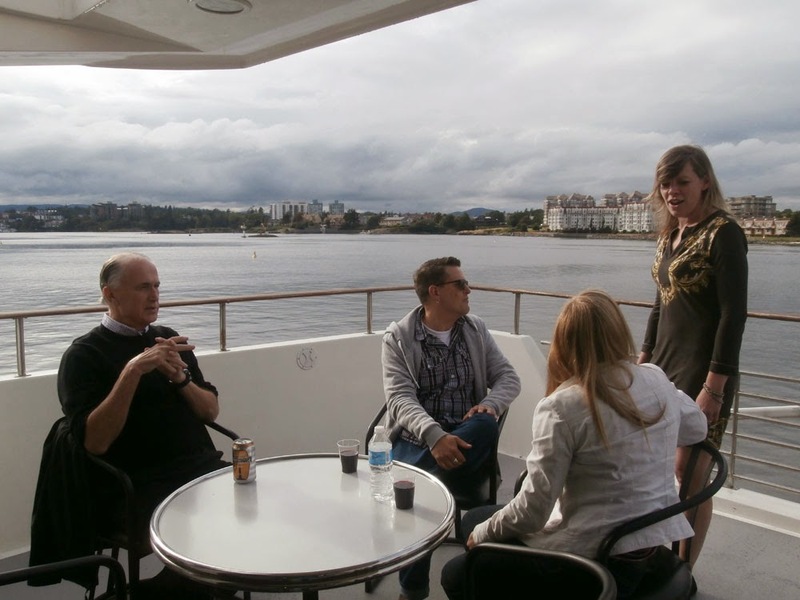 The “softer seat” half of our group chose to go for a little more luxury on one of Orca Spirit's covered vessels with Captain Christian and Naturalist Rachel. Built specifically for whale watching and wildlife viewing, these vessels offer comfortable seating, washroom facilities and elevated outdoor viewing decks for excellent photo opportunities with uninterrupted 360 degree panoramic views. Many of the Orca Sprit fleet vessels are equipped with hydrophones, allowing guests to hear whale vocalizations in the wild. Our captains took us to the north end of San Juan Island where a small group of Orcas were swimming at high speed. Unfortunately the whales are not trained to be where you want them and do what you want them to do. On occasion, they are just not available but the percentage of views in the waters surrounding Victoria is very high. You may see only one whale or you may be lucky and see a super pod (all three resident pods together), or something in between. 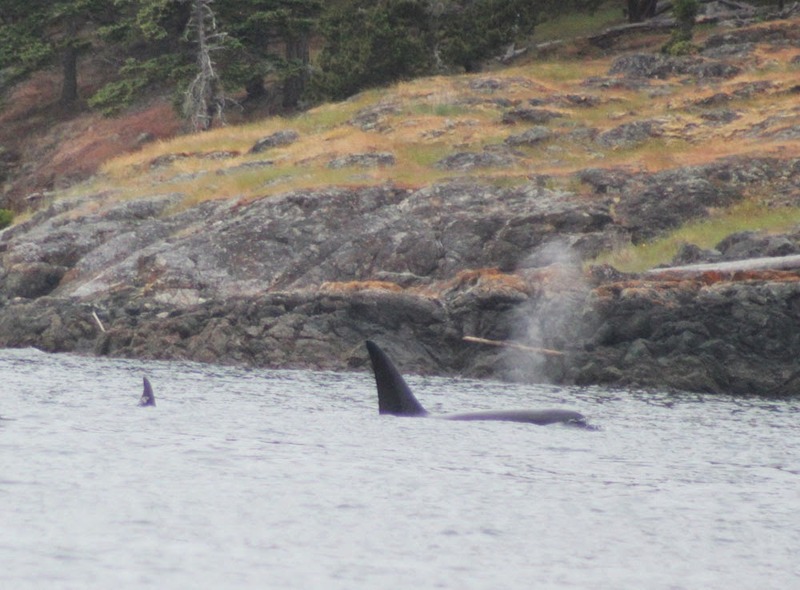 We enjoyed watching a group of three transient Orcas, with a mom and a young one in the group. After some time with the whales, we headed for Sidney by the Sea, where Paul was waiting to transport us onward to Muse Winery. Part Three was a private wine tasting while enjoying scrumptious appetizers, and a tour of the vineyard. Muse Winery is a delightful stop on the north end of the Saanich Peninsula, just off Deep Cove. It is owned and operated by Jane and Peter Ellmann. Jane & Peter bought Chalet Estate Winery in 2008. With years of hospitality, food & beverage savvy betwixt them, the dynamic duo has found their dream lifestyle. Peter’s homage to Jane, his life’s inspiration, was to rename the winery MUSE. Muse grows grapes under the warm sun of the Saanich Peninsula. With grapes from notable vineyards in other regions of Vancouver Island, the Southern Gulf Islands and the Okanagan Valley, they use this fine collection of high quality BC grapes to create exceptional award winning wines, with their signature Mermaid labels. We were greeted in style as we arrived, being offered a glass of their Ortega wine as soon as we stepped from Paul’s chariot. We were led to the spacious Bacchus Room, which is set up beautifully for art, music, brunches, luncheons, dinners, and receptions. Doug Stewart from Stone Street Catering prepares all the food for Muse and we were treated to some of his excellent appetizers and more tastings of Muse wines. It was a happy crowd for sure. After our tasting, Peter toured us through the vineyard and showed us how the wine is processed. At Muse you can purchase their award winning wines, taste a few samples or just try a glass. The gift shop has an eclectic choice of items to choose from. One of life’s great experiences is dining al fresco on the Bistro Muse terrace and watching the resident eagles soar above while bees buzz in the vineyard. Muse produces excellent and entertaining plays in partnership with the Peninsula Players during the summer. The Muse Winery is a gem, well worth the short drive out from Victoria. Thanks to Peter, Jane, Doug and their attentive staff for this part of our adventure. Ever ready, Paul drove us back to the Orca Spirit office where they hosted an after-party. 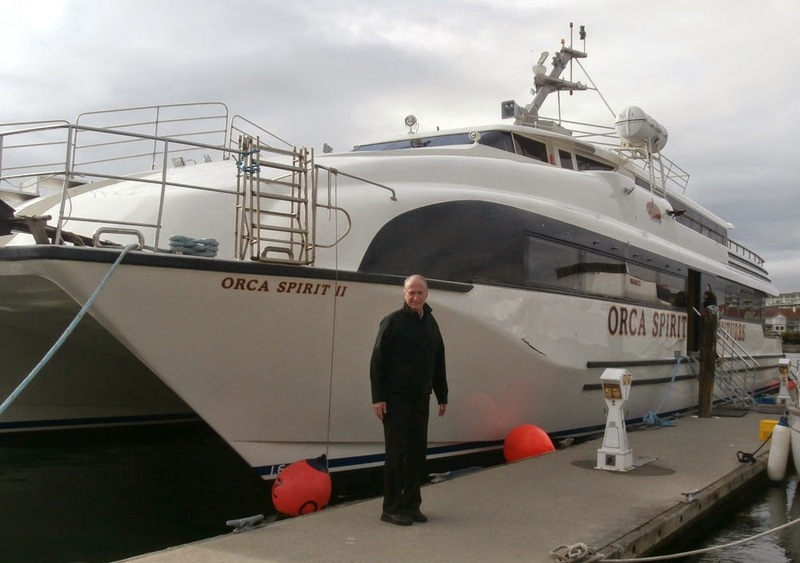 Held aboard their newest vessel, the Orca Spirit II is a 29 metre (95 foot) fibreglass catamaran built by the prestigious Yamaha Corporation, known for its state-of-the-art technology, construction and design. The vessel has a capacity of 168, a cruising speed of 20-25 knots and offers two levels of spacious, heated cabin area with large outdoor viewing decks and all the amenities. What a boat for a party! Great food catered by the Blue Crab Grill of Coast Harbourside Hotel, gracious hosts, the company of good friends and colleagues, and a nice evening made for a wonderful way to end the day. Thanks to Orca Spirit for the adventure, you run a great show!